After just a few weeks of calling for nominations, close to 1,000 total entries and 141 unique entries were received for the Nedgroup Investments and Heavy Chef ‘SA’s Top 5 Most Exciting Startups’ event on the 4th December 2018. Entries were closed on Friday 23 November, and yesterday a shortlist of 12 startups were announced. Today, we reveal the final five. This list was sent to a panel of respected investors, entrepreneurs and community members. A final tally was taken, and then the final tally was ratified by Fred Roed, CEO of Heavy Chef. “In looking at the finalists, it’s important to note the spirit with which this event is intended. By calling for nominations, we’re shining a light on all the amazing work that is being done in this sector. This is a celebration. This is intentionally the ‘most exciting’ startups, not ‘the best’ or ‘the most profitable’. The final five looks at representation, inclusivity, diversity, and of course technological innovation. Using satelite and drone mapping, Aerobotics monitor crops and warns farmers about potential risks, scouts. The mobile app increases accuracy and saves time by planning targeted scouting trips. Farmers can receive accurate statistics for orchards with every drone flight including tree health, tree counts, individual tree size and canopy area. Benjamin Meltzer and his co-founder James Paterson are creating a global agritech business that is solving age-old problems for farmers, worldwide. DataProphet is an AI startup that reduces risk in manufacturing by analysing data in factory production and uses machine learning to identify and eliminate defects and minimises downtime. Its primary product, Omni, seamlessly works on top of existing platforms and manufacturing environments. Isaac Matsa, a natural born salesman, is driving growth for this impressive startup and will be representing DataProphet on stage on Tuesday 4th December. LifeCheq is making financial advice credible and authentic by moving personal financial advice from a biased, commission-based advisor to a subscription service that gives users access to a team of actuaries and experts. Co-founder Abu Addae is an Actuarial Scientist who cut his teeth at Old Mutual, and is now shaking up the industry by providing legitimate, non-biased financial advice at an accessible rate. LifeQ is a world-leading science and technology company that aims to enable people from all walks of life to enjoy optimal health. LifeQ has made significant strides into international markets with its tailored health solutions. LifeQ aims to help people live longer, higher-quality lives. 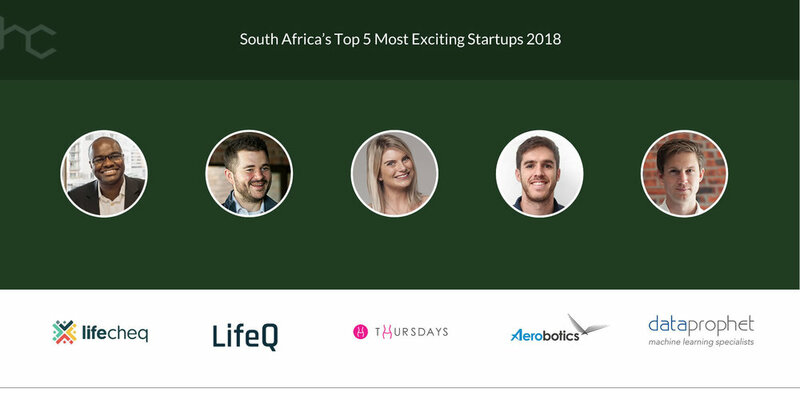 LifeQ’s founder Riaan Conradie will arrive in Cape Town this weekend, just in time to represent one of South Africa’s proudest startup exports. eCommerce startup Thursdays (allegedly named because it was founded by Shona Macdonald on a Thursday) focuses on swimwear and lingerie for women c cup and up. Focused on empowering women in the clothing sector, this is a truly inspiring, fun and heartwarming social entrepreneur venture. Founder, Shona Macdonald, is tackling on the most challenging segments in business and has made healthy strides over the past year. On Tuesday 4th December, a stellar lineup of speakers and personalities will take the stage, followed by some slick beats by DJ Mo Flava to end off a hard year, in style.